In this post, I suggested that reports (WSJ, WaPo) that NSA collects only 20 to 30% of US phone records probably don’t account for the records collected under authorities besides Section 215. So why did WSJ, WaPo, LAT, and NYT all report on this story at once? Why, after 8 months in which the government has taken the heat for collecting all US call records, are anonymous sources suddenly selectively leaking stories claiming they don’t get (any, the stories suggest) cell data? There’s a tall tale the stories collectively tell that probably explains it. None of the stories really explain why NSA didn’t start collecting cell data from the start, when, after all, it got no legal review. Nor did they note that, according to this WSJ article which a few of them cited, NSA does get cell data from AT&T and Sprint. But the stories collectively provide two explanations for why — as cell phones came to dominate US telecommunications — NSA didn’t add them to their Section 215 collection (which remember, is different from not including them in their EO 12333 collection). First, NSA was too busy responding to crises (their 2009 phone dragnet violations and the Snowden leaks) to integrate cell data. The agency’s legal orders to U.S. phone companies don’t cover most cellphone records, a gap the NSA has been trying to address for years. The effort has been repeatedly slowed by other, more pressing demands, such as responding to criticisms from the U.S. court that oversees its operations, people familiar with the matter say. As a result, the NSA’s director, Gen. Keith Alexander, ordered an “end-to-end” review of the program, during which additional compliance incidents were discovered and reported to the court. The process of uncovering problems and fixing them took months, and the same people working to address the compliance problems were the ones who would have to prepare the database to handle more records. The NSA fell behind, the former official said. In June, the program was revealed through a leak of a court order to Verizon by former NSA contractor Edward Snowden, setting off an intense national debate over the wisdom and efficacy of bulk collection. The same NSA personnel were also tasked to answer inquiries from congressional overseers and others about how the program and its controls worked. “At a time when you’re behind, it’s hard to catch up,” the former official said. This claim is pretty ridiculous, given that we know (indeed, several of these reporters got selective leaks about this in October just before Keith Alexander admitted to it) NSA worked on geolocation from 2010 to 2011, which these reporters’ anonymous sources claim is the problem with cell data now. They were working on the problem, if indeed it was one. The existence of that 2010 to 2011 pilot program also presents problems for the other explanation offered: that NSA is legally prohibited from receiving cell geolocation data. Moreover, the NSA has been stymied by how to remove location data—which is isn’t allowed to collect—from cellphone records collected in bulk, a U.S. official said. A key difficulty has been separating location data from cellphone records. NSA has an agreement with the secret Foreign Intelligence Surveillance court that it won’t collect location data from phones. It is true that Alexander told Congress in October NSA would warn Congress and the FISC before they started collecting cell geolocation data again, but NSA still maintained it would be legal to do so. And it is true that the intervening years since the pilot program, the Jones case presented challenges to the practice that even James Clapper admitted — back in 2012 — might force NSA to change its current practices (even while suggesting the rules were probably different for intelligence gathering as opposed to criminal investigation). It’s also possible NSA’s delayed notice to Congress on its geolocation efforts — not even the House Judiciary Committee got notice before the Reauthorization of the PATRIOT Act in 2011 — has created problems for NSA’s collection of geolocation (and therefore, these stories claim, cell data). Nevertheless, the record shows that DOJ and NSA believed the language of the existing Section 215 orders permitted NSA to collect cell location data at least through the end of 2011 and probably still believed it after Jones. So that can’t be the explanation for why NSA hasn’t been collecting cell data (under Section 215, from Verizon and T-Mobile) all these years. But the claim NSA is not permitted to collect geolocation data provides two of these stories reason to report that the purported legal prohibition on the collection of cell location has forced NSA to seek court orders for the cell data in question. The government is taking steps to restore the collection — which does not include the content of conversations — closer to previous levels. The NSA is preparing to seek court orders to compel wireless companies that currently do not hand over records to the government to do so, said the current and former officials, who spoke on the condition of anonymity to discuss internal deliberations. The NSA aims to build the technical capacity over the next few years to collect toll records from every domestic land line and cellphone call, assuming Congress extends authority for Section 215 of the USA Patriot Act after it expires in June 2015. Once the capacity is available, the agency would seek court orders to require telecommunications companies that do not currently deliver their records to the NSA to do so. This is the point of these stories: to prepare us for the argument, in advance of next year’s PATRIOT Act reauthorization, that Section 215 must be expanded to include cell data these reporters claim NSA doesn’t collect (they imply, under any authority) now. NSA told these reporters a story about how meager its (Section 215-based) collection is to prepare for a debate that it needs to expand authority, not curtail it. That said, even as obviously facetious as are the claims that NSA believed it was prohibited from collecting geolocation data even as it was doing so, there have been at least two intervening events, in addition to the Jones decision, that I suspect have changed NSA’s views on cell location data. These may explain why NSA is telling this tall tale now. First, whereas before July 19, 2013 (indeed, for the entire period when it was testing cell location data), NSA had no guidance on whether Section 215 covered cell location, in July, in the wake of Snowden’s leaks, Claire Eagan explicitly excluded Cell Location Site Identifier information from the order (though that is not the only way to get cell location). Furthermore, this Order does not authorize the production of cell site location information (CSLI). That is, the Executive no longer operated at the full expanse of its authority on cell geolocation, because a court bound its authority, at least for Section 215 collection. In addition, as of about two weeks ago and for the first time in 14 years, Verizon Wireless is no longer partially foreign owned. Verizon Wireless and Vodaphone announced plans to split up back in September and on January 28, the board approved the deal. The split will be final on February 21. I suspect (this is speculation, but I will explain in a future post why my confidence on this point is very very high) that the reason NSA is telling this tall tale right now has nothing to do (as some of the stories suggested) with the fact that some of America’s key cell telecoms are partly foreign owned. Rather, I suspect any gap in cell data collection arises instead from the fact that the nation’s largest cell provider, Verizon, is no longer partly owned by a British company and therefore no longer subject to the collection agreements of GCHQ. Say … am I really the only NSA beat writer who is wondering why it is taking ODNI so long to declassify the January 4 FISC reauthorization for the Section 215 dragnet as compared to the previous reauthorizations since the Snowden leak? SEN. MIKULSKI: General Clapper, there are 36 different legal opinions. DIR. CLAPPER: I realize that. SEN. MIKULSKI: Thirty-six say the program’s constitutional. Judge Leon said it’s not. Thirty-six “legal opinions” have deemed the dragnet legal and constitutional, its defenders say defensively, over and over again. But that’s not right — not by a long shot, as ACLU’s Brett Max Kaufman pointed out in a post yesterday. In its report, PCLOB confirmed what I first guessed 4 months ago: the FISA Court never got around to writing an opinion considering the legality or constitutionality of the dragnet until August 29, 2013. FISC judges, on 33 occasions before then, signed off on the dragnet without bothering to give it comprehensive legal review. Sure, after the program had been reauthorized 11 times, Reggie Walton considered the more narrow question of whether the program violates the Stored Communications Act (I suspect, but cannot yet prove, that the government presented that question because of concerns raised by DOJ IG Glenn Fine). But until Claire Eagan’s “strange” opinion in August, no judge considered in systematic fashion whether the dragnet was legal or constitutional. And the thing is, I think FISC judge — now Presiding Judge — Reggie Walton realized around about 2009 what they had done. I think he realized the program didn’t fit the statute. Consider a key problem with the dragnet — another one I discussed before PCLOB (though I was not the first or only one to do so). The wrong agency is using it. Section 215 does not authorize the NSA to acquire anything at all. Instead, it permits the FBI to obtain records for use in its own investigations. If our surveillance programs are to be governed by law, this clear congressional determination about which federal agency should obtain these records must be followed. The Executive convinced the FISA Court, over and over and over, to approve collection for NSA’s use using a law authorizing collection only by FBI. Which is why I wanted to point out something else Walton cleaned up in 2009, along with watchlists of 3,000 Americans who had not received First Amendment Review. Judge Reggie Walton disappeared the FBI Director. That is, Walton took out the paragraph — which he indicated in his opinion 3 months earlier derived from the statutory language at 50 U.S.C. § 1861 (c)(1) — pertaining to the FBI Director. The paragraph always fudged the issue anyway, as it doesn’t discuss the FBI Director’s authority to obtain this for the NSA. Nevertheless, Walton seems to have found that discussion unnecessary or unhelpful. (1) Upon an application made pursuant to this section, if the judge finds that the application meets the requirements of subsections (a) and (b), the judge shall enter an ex parte order as requested, or as modified, approving the release of tangible things. Such order shall direct that minimization procedures adopted pursuant to subsection (g) be followed. And here are two key parts of subsections (a) and (b) — in addition to “relevant” language that has always been included in the dragnet orders. (B) an enumeration of the minimization procedures adopted by the Attorney General under subsection (g) that are applicable to the retention and dissemination by the Federal Bureau of Investigation of any tangible things to be made available to the Federal Bureau of Investigation based on the order requested in such application. FBI … FBI … FBI. The language incorporated in 50 USC 1861 (c)(1) that has always been cited as the standard judges must follow emphasizes the FBI repeatedly (PCLOB laid out that fact at length in their analysis of the program). And even Reggie Walton once admitted that fact. And then, following his lead, FISC stopped mentioning that in its statutory analysis altogether. Eagan didn’t even consider that language in her “strange” opinion, not even when citing the passages (here, pertaining to minimization) of Section 215 that directly mention the FBI. Section 215 of the USA PATRIOT Act created a statutory framework, the various parts of which are designed to ensure not only that the government has access to the information it needs for authorized investigations, but also that there are protections and prohibitions in place to safeguard U.S. person information. It requires the government to demonstrate, among other things, that there is “an investigation to obtain foreign intelligence information … to [in this case] protect against international terrorism,” 50 U.S.C. § 1861(a)(1); that investigations of U.S. persons are “not conducted solely upon the basis of activities protected by the first amendment to the Constitution,” id. ; that the investigation is “conducted under guidelines approved by the Attorney General under Executive Order 12333,” id. § 1861(a)(2); that there is “a statement of facts showing that there are reasonable grounds to believe that the tangible things sought are relevant” to the investigation, id. § 1861(b)(2)(A);14 that there are adequate minimization procedures “applicable to the retention and dissemination” of the information requested, id. § 1861(b)(2)(B); and, that only the production of such things that could be “obtained with a subpoena duces tecum” or “any other order issued by a court of the United States directing the production of records” may be ordered, id. § 1861(c)(2)(D), see infra Part III.a. (discussing Section 2703(d) of the Stored Communications Act). If the Court determines that the government has met the requirements of Section 215, it shall enter an ex parte order compelling production. Reggie Walton disappeared the FBI Director as a statutory requirement (he retained that preamble paragraph, the nod to authorized FBI investigations, and the perfunctory paragraph on minimization of data provided from NSA to FBI) on March 5, 2009, and he has never been heard from in discussions of the FISC again. Now I can imagine someone like Steven Bradbury making an argument that so long as the FBI Director actually signed the application, and so long as the FBI had minimization procedures for the as few as 16 tips they receive from the program in a given year, it was all good to use an FBI statute to let the NSA collect a dragnet potentially incorporating all the phone records of all Americans. I can imagine Bradbury pointing to the passive construction of that “things to be made available” language and suggest so long as there were minimization procedures about FBI receipt somewhere, the fact that the order underlying that passive voice was directed at the telecoms didn’t matter. That would be a patently dishonest argument, but not one I’d put beyond a hack like Bradbury. The thing is, no one has made it. Not Malcolm Howard in the first order authorizing the dragnet, not DOJ in its request for that order (indeed, as PCLOB pointed out, the application relied heavily on Keith Alexander’s declaration about how the data would be used). The closest anyone has come is the white paper written last year that emphasizes the relevance to FBI investigations. But no one I know of has affirmatively argued that it’s cool to use an FBI statute for the NSA. In the face of all the evidence that the dragnet has not helped the FBI thwart a single plot — maybe hasn’t even helped the FBI catch one Somali-American donating less than $10,000 to al-Shabaab, as they’ve been crowing for months — FBI Director Jim Comey has stated to Congress that the dragnet is useful to the FBI primarily for agility (though the record doesn’t back Comey’s claim). Which leaves us with the only conclusion that makes sense given the Executive’s failure to prove it is useful at all: it’s not the FBI that uses it, it’s NSA. They don’t want to tell us how the NSA uses it, in part, because we’ll realize all their reassurances about protections for Americans fall flat for the millions of Americans who are 3 degrees away from a potential suspect. But they also don’t want to admit that it’s the NSA that uses it, because then it’ll become far more clear how patently illegal this program has been from the start. Better to just disappear the FBI Director and hope no one starts investigating the disappearance. ODNI released a bunch of the remaining phone dragnet primary orders (and amendments) here. I will have more to say about this later. Of particular note, though, they seem to be withholding the BR 09-15 primary order, which was right in the middle of PATRIOT reauthorization, when NSA kept disseminating results in violation of Reggie Walton’s orders. 1/19: Updated to add the 7/9/09 order and BR 09-19. 1/20: There is one more missing primary order. In an NSA declaration dated November 12, SID Director Theresa Shea said there had been 34 approvals. As shown above, the McLaughlin order is the 33rd of identified orders. 1/26: I think I’ve corrected all the date errors I originally hate (the date stamp is not all that accurate). For the 2011-2013 dates, I’ve worked backwards of the 4/25/13 order. WaPo has a biting profile of Robert Litt, ODNI’s General Counsel who made one more failed attempt to rationalize James Clapper’s lies to Congress last week. One of the most newsworthy bits is that WaPo published the name of Alfreda Frances Bikowsky, the analyst who got Khaled el-Masri kidnapped and tortured by mistake, for the first time. A far more subtle but equally important detail comes in its description of why House Intelligence Chair Mike Rogers banned Litt from appearing before the Committee last summer. Some lawmakers have found Litt’s manner off-putting at best. Rogers, the chairman of the House Intelligence Committee, made clear to the DNI’s office last summer that Litt was no longer welcome before his panel. For what it’s worth, I suspect Rogers is not worried as much about Litt’s honesty (Rogers hasn’t objected to James Clapper or Keith Alexander’s lies, for example, and has himself been a key participant in sustaining them), but rather, for his usual candor and abrasiveness, which the article also shows inspiring members of Congress to want to repeal the dragnet. Litt couches his answers in legalese, but unlike most IC witnesses, you can often parse it to discern where the outlines of truth are. That refers, of course, to Rogers’ failure to make the Administration’s notice on the phone dragnet available to members in 2011, before the PATRIOT Reauthorization. As a result of that, 65 Congressmen voted to reauthorize the PATRIOT Act without full notice (perhaps any formal notice) of the phone dragnet — a sufficiently large block to make the difference in the vote. In spite of that fact, the Administration and even FISA Judges have repeatedly pointed to Congress’ reauthorization of the phone dragnet to explain why it’s legal even though it so obviously exceeds the intent of the Section 215 as passed. Apparently Litt blames Rogers for that. And doing so got him banished from the Committee. So it is Rogers’ fault the Administration should not be able to claim Congress ratified the FISA Court’s expansive understanding of Section 215. And Rogers and Litt’s spat about it make it clear they both know the significance of it: claims of legislative ratification fail because Congress did not, in fact, know what they were voting on, at least in 2011. Unsurprisingly, that has not prevented the Administration from making that claim. Litt himself made a variety of it before PCLOB in November, months after he had this fight with Rogers. [NSA General Counsel Raj] DE: So in other words, and some of this is obviously known to you all but just to make sure members of the public are aware, not only was this program approved by the Foreign Intelligence Surveillance Court every 90 days, it was twice, the particular provision was twice re-authorized by Congress with full information from the Executive Branch about the use of the provision. MR. LITT: I just want to add one very brief comment to Raj’s in terms of the extent to which Congress was kept informed. By statute we’re required to provide copies of significant opinion and decisions of the FISC to the Intelligence and Judiciary Committees of both Houses of Congress and they got the materials relating to this program, as we were required to by law. Now, Litt’s intejection here is particularly interesting. He doesn’t correct De. He shifts the claim somewhat, to rely on Judiciary and Intelligence Committee notice. But even there, his claim fails, given that the Administration did not provide all relevant opinions to those Committees until after the first dragnet reauthorization in 2010. Litt probably thinks that’s okay because he didn’t qualify when Congress got the materials. But it’s still a blatant lie, according to the public record. More significantly, the Administration repeated that lie to both the FISC and, more significantly still, the 3 Article III Judges presiding over challenges to the dragnet generally. The Administration keeps running around, telling everyone who is obligated to listen that Congress has ratified their expansive interpretation of the phone dragnet. It’s not true. And the fact that Litt and Rogers fought — way back in the summer — over who is responsible makes it clear they know it’s not true. But they still keep saying it. Sorry for my silence of late, particularly regarding William Pauley’s ruling finding the phone dragnet legal. The good news is my mom can now reach the light switch in her sewing room without risk of falling. Pauley says the government could not find the “gossamer threads” of terrorist plotters leading up to 9/11. They did find them. They simply didn’t act appropriately with them. He unquestioningly considers the 3 uses of Section 215 (with Zazi, Headley, and Ouazzani) proof that it is effective. He does not note that even Keith Alexander has admitted it was only critical in one case, one not even mentioned in the government’s filings in this case. He ignores the role of the Executive in willingly declassifying many details this program, instead finding it dangerous to allow the ACLU to sue based on an unauthorized leak. The government has actually been very selective about what Snowden-leaked programs they’ve declassified, almost certainly to protect even more problematic programs from legal challenge. He claims Congress has renewed Section 215 7 times (including 2001, it was renewed it 5 times). He claims there is no doubt the Intelligence and Judiciary Committees knew about the rulings underlying the program in spite of the fact that some rulings were not provided until after Section 215 was renewed; he admits that the limits on circulation of notice in 2011 was “problematic” but asserts the Executive met its statutory requirements (he doesn’t deal with the evidence in the record that the Executive Branch lied in briefings about the conduct of the dragnet). There are also Pauley’s claims about the amount of data included — he says the government collects all phone metadata; they say NSA collects far less data. This is a more complicated issue which I’ll return to, though maybe not until the New Year. But I’m most interested in the evidence Pauley points to to support his claim that the FISC (and Congress) conduct adequate oversight over this program. He points to John Bates’ limits to the government’s intentional collection of US person data via upstream collection rather than Reggie Walton’s limits to Section 215 abuses. For example, in 20011, FISC Judge Bates engaged in a protracted iterative process with the Government–over the Government’s application for reauthorization of another FISA collection program. That led to a complete review of that program’s collection and querying methods. He then immediately turns to Claire Eagan’s opinion reiterating that the government had found and dealt with abuses of the phone dragnet program. In other words, for some bizarre reason he introduces a series of rulings pertaining to Section 702 — and not to Section 215 — to support his argument that the government can regulate this Section 215 collection adequately. It’s particularly bizarre given that we have far more documents showing the iterative process that took place in 2009 pertaining directly to the phone dragnet. Why even mention the Bates rulings on upstream collection when there are so many Reggie Walton ones pertaining directly to Section 215? I suspect this is because Pauley relies so heavily on the adequacy of the minimization procedures imposed by the FISC, as when he cites Claire Eagan’s problematic opinion to claim that without adequate minimization procedures, FISC would not approve Section 215 phone dragnet orders. Without those minimization procedures, FISC would not issue any section 215 orders for bulk telephony metadata collection. The only way Pauley can say the limits he points to in his analysis — that NSA can only analyze 3 hops deep, that FBI only gets summaries of the queries, that every query got approved for RAS — is if he ignores that for the first 3 years of the program, all of these claims were false. He uses similar analysis to dismiss concerns about the power of metadata. But [ACLU’s contention that the government could use metadata analysis to learn sensitive details about people] is at least three inflections from the Government’s bulk telephony metadata collection. First, without additional legal justification–subject to rigorous minimization procedures–the NSA cannot even query the telephony metadata database. Second, when it makes a query, it only learns the telephony metadata of the telephone numbers within three “hops” of the “seed.” Third, without resort to additional techniques, the Government does not know who any of the telephone numbers belong to. These last assertions are all particularly flawed. Not only have these minimization procedures failed in the past, not only has the government been able to go four hops deep in the past (which could conceivably include all Americans in a query), not only is there abundant evidence — which I’ll lay out in a future post — that the government does know the identities of at least some of those whom it is chaining, but there are two ways the government accesses this data for which none of this is true: when “data integrity analysts” fiddle with the data to prepare it for querying, and when it is placed in the “corporate store” and analyzed further. All the claims about minimization Pauley uses to deem this program legal have big big problems. The NSA conducted a fraud on the FISC for 3 years (and still is, to the extent they claim the violations under the program arose from complexity rather than their insistence on adopting all the practices used under the illegal program for the FISC-authorized program). Yet Pauley points to the FISC to dismiss any Constitutional concerns with this program. And to do that, he ignores the abundant evidence that all his claims have been — and may still be, in some cases — false. I’ve seen a lot of outright errors in the reporting on the John Bates opinion authorizing the government to restart the Internet metadata program released on Monday. Bates’ opinion was likely written in July 2010. We know it had to have been written before October 3, 2011, because Bates’ opinion of that date cites this one (page 17 footnote 15). It was almost certainly written before May 2, 2011, because that’s when the government “clarified” its upstream production included US person content, which was likely a response to this opinion. According to Claire Eagan, it was written in 2010; this quotation from Eagan’s opinion cites page 73 of this opinion (though she leaves out one word — “analytic” — from this quotation). It had to have been written after June 21, 2010 and probably dates to between June 21 and July 23, 2010, because page 92 footnote 78 cites Holder v. HLP (which was released on June 21), but uses a “WL” citation; by July 23 the “S. Ct.” citation was available. (h/t to Document Exploitation for this last observation). So: it had to have been written between June 21, 2010 and October 3, 2011, but was almost certainly written sometime in the July 2010 timeframe. 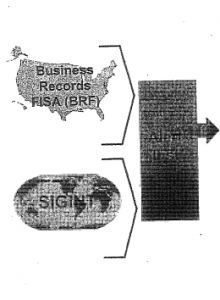 Sometime next week, I will have a post on what known documents the government chose not to release in yesterday’s dump — a significant chunk, for example, almost certainly show how the dragnet programs are tied inextricably to the content programs. But for now, we’re getting increased clarity on the phone and Internet dragnet program. One thing that seems clear is that there is no opinion authorizing the phone dragnet, as I suggested two months ago. And the application makes it clear it relies on Kollar-Kotelly’s opinion as its legal justification. The first instance of doing so, tellingly, makes it clear FISC approval is designed primarily to give legal sanction for the program, not to assess whether the program actually is legal. The Application is completely consistent with this Court’s ground breaking and innovative decision [redacted] in [redacted]. In that case, the Court authorized the installation and use of pen registers and trap and trace devices to collect bulk e-mail metadata [redacted]. The Court found that all of “the information likely to be obtained” from such collection is “relevant to an ongoing investigation to protect against international terrorism.” 50 U.S.C. § 1842(c)(2); [redacted] 25-54. The Court explained that “the bulk collection of meta data–i.e., the collection of both a huge volume and high percentage of unrelated communications–is necessary to identify the much smaller number of [redacted] communications.” Id. at 49. Moreover, as was the case in [redacted], this Application promotes both the twin goals of FISA: facilitating the foreign-intelligence collection needed to protect American lives while at the same time providing judicial oversight to safeguard American freedoms. Let’s pause and reflect on this point for a moment. We can now say with some certainty that a great many dragnet applications stem from the Kollar-Kotelly opinion. That’s because we have almost certainly identified the two opinions named in Claire Eagan’s opinion from earlier this year. [Update] Another thing suggests the Bates opinion dates to 2010. The language in the December 2009 notice to Congress suggests ongoing problems, and includes the Internet metadata problems, whereas the February 2011 notice includes far more redacted discussion (yet still treats an active Internet metadata program. In addition, we know from the geolocation materials that the government didn’t get an opinion dedicated to that application before they started. DOJ advised in February 2010 that obtaining the data for the described testing purposes was permissible based upon the current language of the Court’s BR FISA order requiring the production of’ all ca11 detail records.’ It is our understanding that DOJ also orally advised the FISC, via its staff, that we had obtained a limited set of test data sampling of cellular mobility data (cell site location information) pursuant to the Court-authorized program and that we were exploring the possibility of acquiring such mobility data under the BR FISA program in the near future based upon the authority currently granted by the Court. There are 2004, 2006, 2008, 2010, and 2013 opinions that relate to Section 215 (and, I suspect, other activities as well; updated with typo fixed). But at the very least, Kollar-Kotelly’s opinion authorized gathering substantially all the phone and (by 2010) Internet metadata in the country, as well as (starting in 2010) some subset of geolocation data). Kollar-Kotelly, then, is the primary analysis the government has always relied on to construct maps charting the relationships of every American. Guaranteeing the government doesn’t violate the Constitution was supposed to safeguard American freedoms. But with the Kollar-Kotelly opinion and all that follows from it, impotent oversight has came to substitute for defending the Constitution.